Our hotel was rather cute and every morning we were there we got a little complimentary breakfast bag delivered outside our room. It consisted of a couple of croissants and some juice and was perfect for giving us the energy we needed to get up and out. This particular day was very sunny, about 31, and we walked to our destination alongside the river. 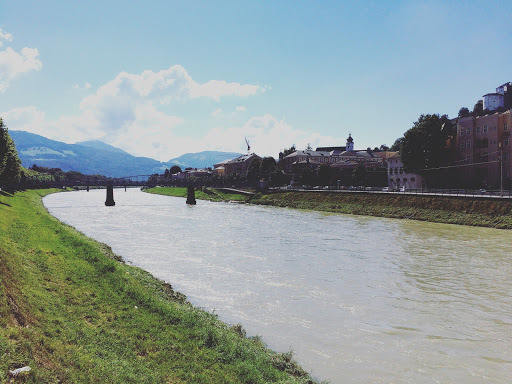 We instantly noticed how bike friendly Salzburg was, with clear cycle lanes alongside the footpaths. It seemed a really easy way to get around. The river was so beautiful to walk amongst. It was incredibly quiet on our side of the river. 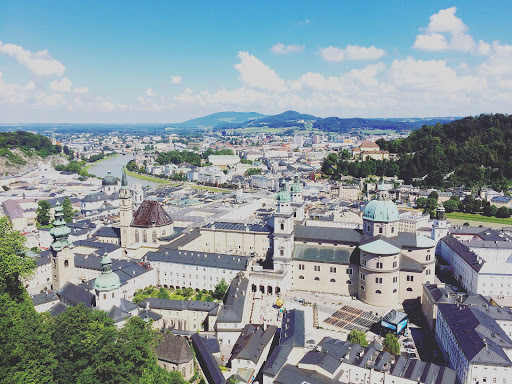 We really felt like we could see for miles, there were the mountains and we could also see our destination, the Hohensalzburg Fortress. When we walked across the bridge to the other side of the river we decided to get food before we continued any further and grabbed some juicy bratwurst from a street vendor. Adam had some kind of paprika sausage, which looked good but a bit too spicy for me! 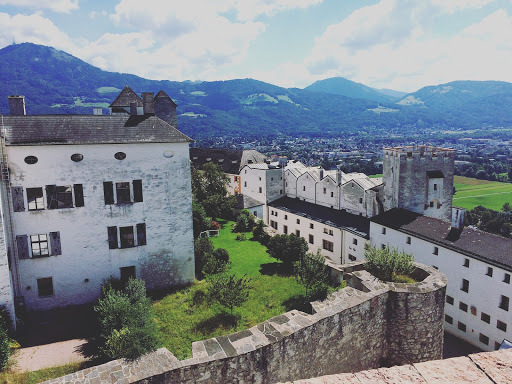 We then caught the funicular up to the Fortress Hohensalzburg, one of the largest medieval castles in Europe. The ticket cost 15.20 euro (although its a few euros cheaper if you book online) and that included the return journey on the funicular, entry to all the rooms within the fortress and the audio guide. You could walk up to the fortress but it was incredibly steep so I wouldn’t recommend it unless you consider yourself to be quite fit. The funicular is the oldest in Europe, built in 1892, so its an worth a go anyway. 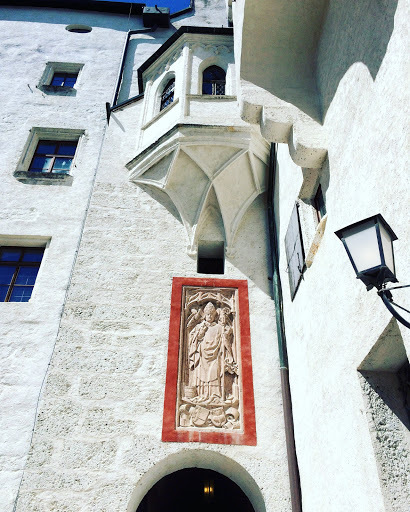 The fortress was built in 1077 by the very powerful archbishops of Salzburg and remained unconquered during its time as a fortress until it was surrendered without a fight to the French troops in 1800. The fortress was lovely to walk around, it offered the most stunning views of the surrounding mountains and had a lot of beautiful courtyards. You could go inside and look around, although I should note that there were a number of steep stairways so this could be difficult for the less able bodied. Being a Sunday a number of shops weren’t open but we were able to grab some stuff from the Billa supermarket in town, which we ate by the river. Simple pleasures and all! We then headed down Linzergrasse, the main high street, because although the shops were closed we wanted to go to St Sebastians church. The baroque church is quite pretty but my interest lay in the adjoined cemetery. 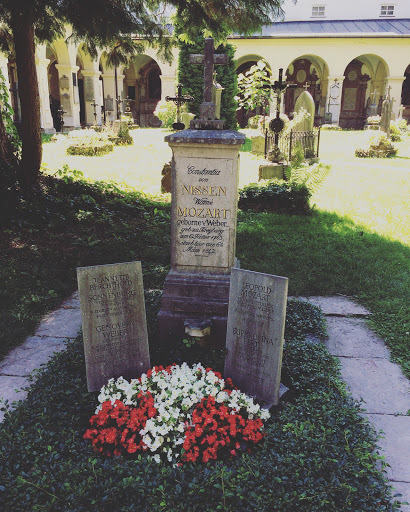 The Mozart family tomb lies here as well as the burial places of various Austrian royals. It was a very sweet place. 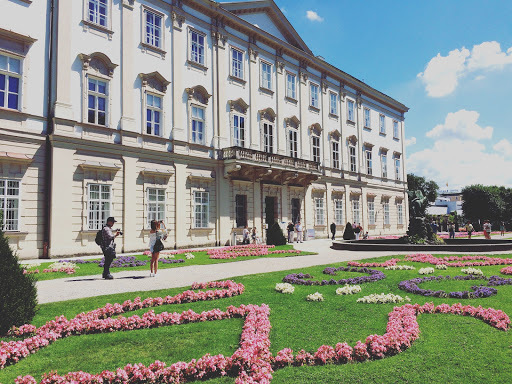 From there we headed to Mirabell Palace, a famous shooting location for the ‘Sound of Music’. 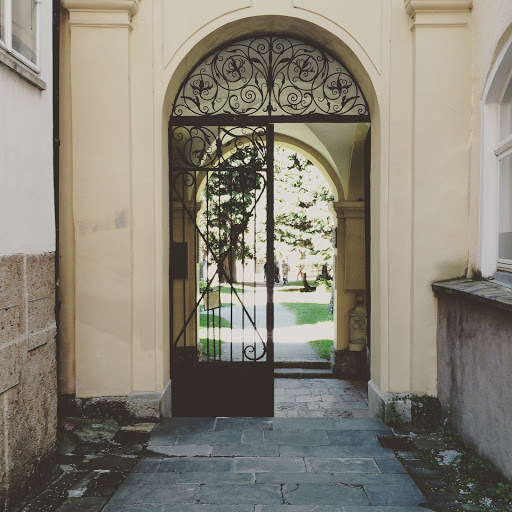 First built in 1606 as a love token for a mistress it has blossomed into the most beautiful baroque destination, right in the heart of the city. 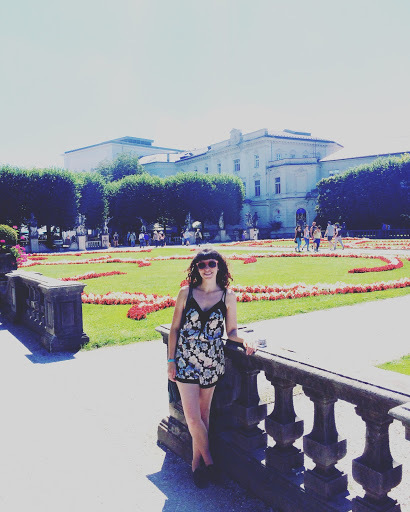 It has some lovely fountains and lots to look around, plus it’s all free! By this time the heat had left us pretty exhausted so we headed back to our hotel, again having to settle for a McDonalds due to the Sunday closures. A pretty good end to a wonderful day though!